Ruby Tuesday is the brain-child of Mary at Work of the Poetgo visit all the Ruby people there. This week Mary suggested "we might post Thanksgiving photos that have RED in them." Sorry Mary, I had nada in that category; but I do have these taken last week at the beach. Red surfboard, just screamed Ruby Tuesday. Never seen a red surfboard before, it truly stands out! Lovely shots. Happy Ruby Tuesday! 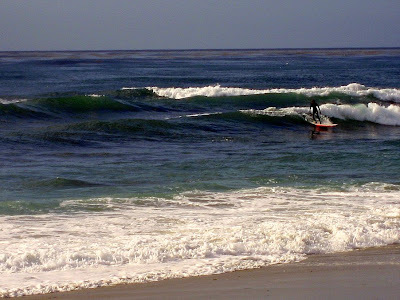 Yep, the surfboard sure does cry out Ruby Tuesday. Red is a good color for a surfboard as I'm sure it's easier to find if the surfer falls off, eh? What a contrast: your photo of a surfer and mine of a snowy field. That red surfboard really pops out, I like it! Last week at the beach ? I would have loved to be there too. 'Scream' is exactly the good word! 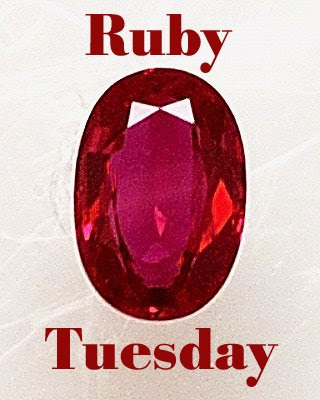 You couldn't pass nearby without hearing "Ruby Tuesday post, Ruby Tuesday Post". What a great Ruby Tuesday! Great Ruby Tuesday post! I really like it. And thanks for visiting my wagonwheel photo for Shadow Sunday. Much appreciated! 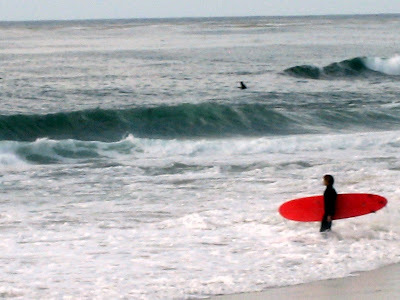 I like a red surf board better than Thanksgiving anyway. Cool shots. I love the dramatic red of the surf board in the first one and sort of heroic "human against the sea" posture of it's owner. Come to my blog, I have an award for you (come in about 15 minutes!) :) It's 4:30 PM EST right now.